So said Sir Winston Churchill, master of the spoken word, purveyor of linguistic lyricism, whose rhetoric inspired a nation at its most vulnerable. But how are the words uttered some 70 years ago bya British Prime Minister relevant to B2B content marketers in today's digital world? We live in an age where technology is hurtling us forward at a dizzying pace. And yet, language, the way we express our thoughts and interact with that technology, is evolving far more gently - so that the words and liguistic form of yesterday can achieve just as much resonance with a contemporary audience. The truth is that there are valuable lessons for the blog writers of today to be learnt from the eloqent and the erudite of the past. What you really need is advice on how to do it, how to actually writeit. I'm talking about how to master the “rhetoric of the blog”, so that your content writing achieves not only a change in the ways that it is possible for your audience to think, but also persuades them to change their behaviour. So what can we learn from the great orators of the past as to how we should “speak” our content in the here and now? 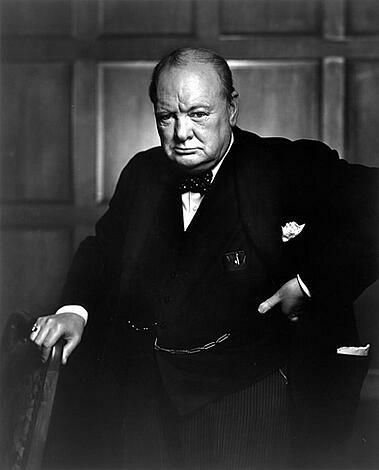 Let us return then to one of the most instinctive and accomplished rhetoricians of all time, Sir Winston Churchill - the man who “mobilised the English language and sent it into battle”. He drew on the full range of classical rhetorical devices to turn mere words into irresistible, emotive tools of persuasion. Struggling to think where (or why) you might use this kind of device in your content? Here's an invented example from topical sources. No longer would you write: “Britain's economic performance has unfortunately been beaten by most of the other countries in the Eurozone.” Instead, you will intone: “Begone British boasts of better to come; today our tiny island trails on the tailcoats of the territories that have trumped us!” See what I did there? The good news is that you don't need a radio (or a cigar!). Want to comment, say, on how choosing manual intervention over automation forces up costs needlessly? Then you simply declare that it is a “furtive assertion that good sense has deserted those it previously served.” Per-fect. Metaphor (translation: turning a concept into physical imagery). Churchill invented one of the most powerful, trademark metaphors ever conceived when he thundered: “An iron curtain has descended across the Continent.” No “like”, no “similar to,” no “kind of.” It was an iron curtain. In the same way the big data that you talk about in your B2B blog is not “an important influence on how we live our lives and do business”. No, it is “an electron microscope through which all human behaviour will eventually pass”. It really is. In an era that is defined by image and video…think visual. Tricolon (translation: the use of words, phrases, examples, or the beginnings or endings of phrases or sentences in threes.) The tricolon gave Churchill one of his most rousing soundbites of the entire war: “Never...has so much been owed by so many to so few." So don't argue for “really great service to bring the customer back time and again.” Instead, thump it out freely (and threely), thus: “Never has any business brought customers back time and again without exceptional service, delivered consistently and improved constantly.” Triple whammy. Am I stretching credibility, suggesting that your content marketing should be informed by a man who was born in 1874? Well, some of today's most authoritative marketing sources cite Aristotle's rhetorical tools of “Logic, Emotion and Character” as continuing to be instrumental in successful content marketing – and he died in 322BC! B2B content marketers should “study up” on it, they insist. Your writing is speech, your speech is persuasion, your persuasion brings action. Now go and work that room!